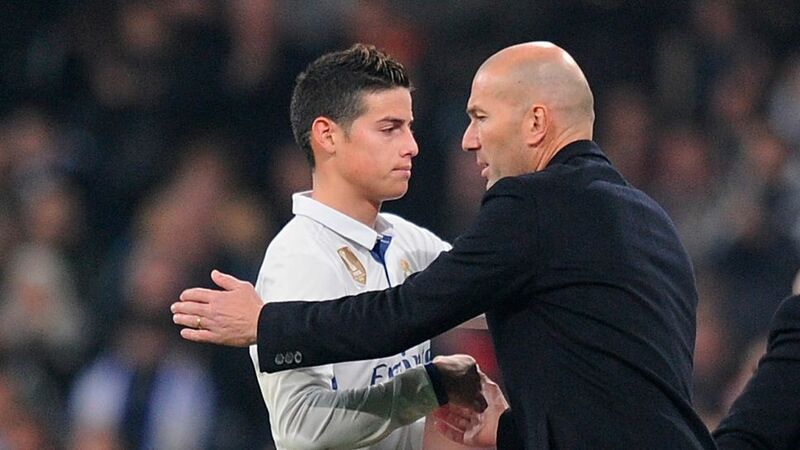 Real Madrid manager Zinedine Zidane has admitted that he would rather have seen James Rodriguez stay at the club instead of joining Bayern Munich on loan last summer, as the two European heavyweights prepare to clash in the UEFA Champions League semi-finals. James moved to Real following his star turn at the 2014 FIFA World Cup, where he scored six goals and won the Golden Boot with quarter-finalists Colombia. But after an excellent first season under Carlo Ancelotti – the man who later brought him to Bayern – the 26-year-old found his game time limited under Rafael Benitez and then Zidane. James has thrived in his first season in Bavaria, despite the fact that Ancelotti was replaced by Jupp Heynckes in early October. With six goals and 10 assists, he has been one of Bayern’s chief creative outlets on their road to a record sixth consecutive Bundesliga title. James signed a two-year loan deal with the record Bundesliga champions last July, which club CEO Karl-Heinz Rummenigge recently described as a “very, very good transfer”. Bayern are expected to activate the Colombian’s buyout clause of €42 million in summer 2019 – and the player will no doubt be keen to show Real what they are missing on Wednesday.